For at least one day this fall, authentic Chinese food was available in Athens: homemade mooncakes, rice with stewed pork, steamed buns filled with diced meat. The unlikely venue was Tate Student Center on the UGA campus. The day was Sept. 23, when Chinese students gathered to celebrate the Mid-autumn festival. – a major event in the Chinese calendar – with traditional recipes, lovingly prepared. Wang hasn’t been back to China since she came to Athens two years ago to study marine science, and she misses it. Eating authentic Chinese dishes on this festive day eased her homesickness. 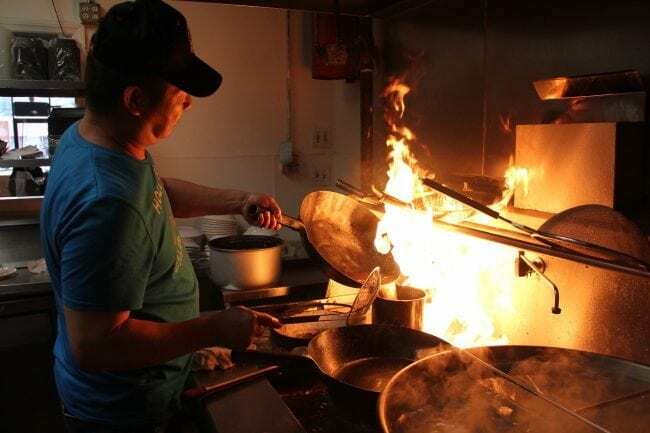 During the rest of the year, however, students from China say the closest source for authentic Chinese food is not in Athens at all, but at Wok Star in Winterville. A few days before the Tate Center gala, Wang and her friend Shuang Zou got an early start on the Mid-autumn festival at the Winterville restaurant. Zou is a second-year master’s student majoring in science education and a big fan of Wok Star. “You are here again!” said food server Nudles Beck, welcoming Shuang Zou and her friends. It was a typical Tuesday night. He was serving five tables, and three out of five were occupied by Chinese customers. What she means is not the American-Chinese fusion menu that dates to early Chinatowns in cities such as San Francisco. Dishes such as General Tso’ s chicken and Sweet Sour Chicken don’t register as “Chinese” to most people who grew up in China. The American version involves more deep-fried foods and heavier sauces. Whether people like one or the other probably depends on where they grew up. Unlike other big cities in the U.S., Atlanta does not have a Chinatown. Instead, it has ethnic enclaves on suburban strips such as Buford Highway. One of Buford Highway’s standouts is Bo Bo Garden, a traditional Cantonese restaurant just inside I-285. Red lanterns dangle from the ceiling, wooden relief sculptures just out from the balls, and servers bustle about with loads of savory, steaming food. Mingdong Song and Xiao Jia, Clemson University students who are from China, drive to Atlanta about monthly to satisfy their appetite for authentic food. They ordered tofu fried with chives and a bowl of spicy boiled fish at Bo Bo garden. “American-Chinese food is too sweet, and it contains lots of deep-fried ingredients,” Song said. The chives garnishing the tofu are a sign of the real thing, Jia said. “Authentic Chinese food needs to use particular vegetables.” Szechuan spicy eggplant, for example, has to start with the long, slim eggplant in China instead of the larger, rounded varieties favored by Americans and Europeans. They just don’t taste the same, he said. Zhang came to Georgia 10 years ago with her parents. In her mind, authentic Chinese food is what her mother prepared at home. Working in the restaurant world, she’s learned that the more American customers a Chinese eatery attracts, the more American-Chinese dishes the owners will put on the menu. One third of Bo Bo Garden’s offerings are American-Chinese. Nearby, Golden BBQ is heading in a different direction: it will soon stop serving American-Chinese food. Chen was born in Fuzhou City, a provincial capital on the Taiwan Strait. He grew up in a food culture that resembles Taiwanese cooking. This type of cuisine is known to be light but flavorful, and contains seafood as well. He worked in restaurants in New York before moving to Atlanta in 2015 and launching Golden BBQ with a business partner. His partner managed the restaurant for the first five months, profits were low and customers gave the place bad reviews. He broke off the partnership in June 2016 and started over with friends his hometown in China. Authentic Chinese food needs to taste like home. So his kitchen prepares sauces from scratch and makes handmade snacks, even though such touches take time and cost money. He expects word to spread. For now, “90 percent of customers at our restaurant are Americans,” Chen said, “I think as long as the food tastes good, everybody will like it”. How Athens, GA could benefit from Georgia's 911 Medical Amnesty Bill.